The highly customisable school rewards system / house point system that can be used to record and recognise students' achievements, good attendance, taking part in extra-curricular activities, healthy eating etc. Students have an online login where they can see their attendance, achievements and points. Student feedback has been used to develop the student interface, which contains colourful charts and many features to keep students interested in their progress. Above: Secondary-age student homepage. Features can be customised. All achievement information can be accessed by staff at the school, which can be used for meetings and parents' evenings. Parents can also have their own login to get an overview of their children's achievements, which improves communication between school and home - favoured by Ofsted. Integration with SIMS, Integris, iSAMS (or other MIS software) can reduce teacher workload by automatically maintaining class lists and awarding points for attendance and punctuality. Schools using Pupil Reward Points as a key part of their behaviour management policy find that it motivates students and improves pupil well-being. 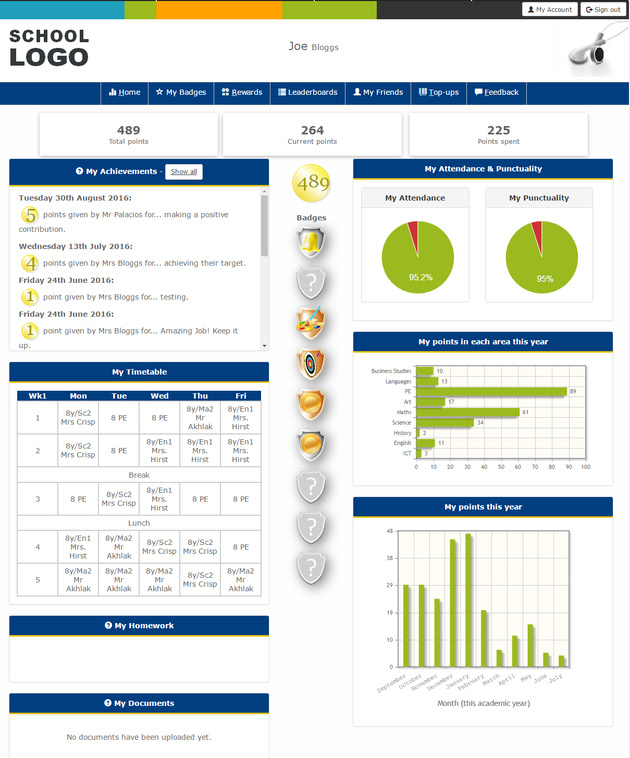 Monitor how consistently your rewards policy is being used across the school by generating instant live reports by department and individual members of staff. Your school can decide to set up a rewards shop where students can spend their points. If so, your school has complete control over what rewards it offers. Rewards can cost the school no money at all by offering special privileges and receiving donated rewards from parents and local organisations. Other examples of possible rewards include vouchers, trips out of school, sports equipment, charity donations, books, CDs / DVDs etc. This system can work with any currency - house points, stickers, stars, credits or something else. Our in-house developers can develop a completely unique system for your school.